So I have been working through my house like a mad woman doing some major organizing and purging following A Bowl Full of Lemons plan. 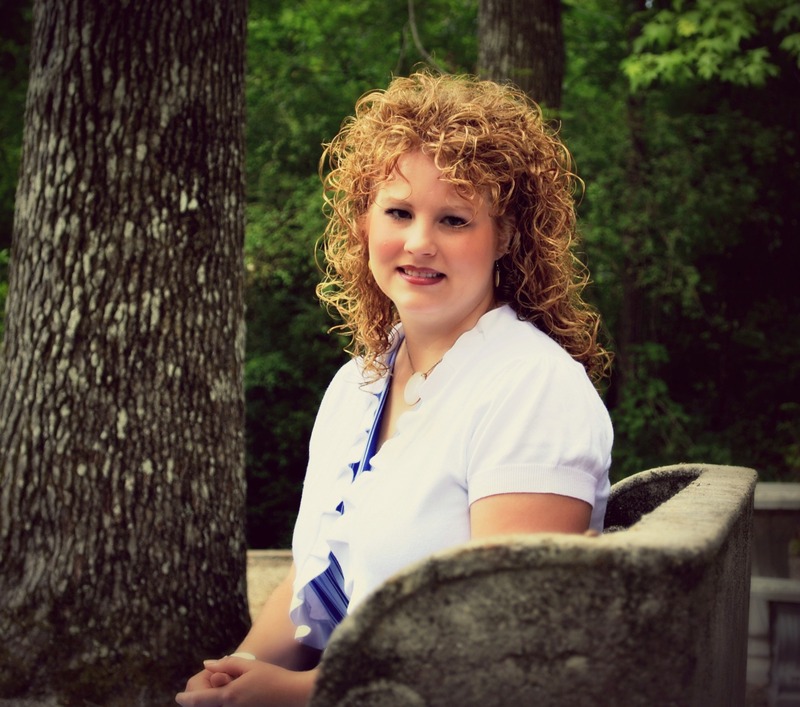 I have several projects I can’t wait to share with you. Last week I focused on the kitchen and made some small but significant changes in there that have made a HUGE difference in the function of my kitchen and bonus – they look pretty good too! 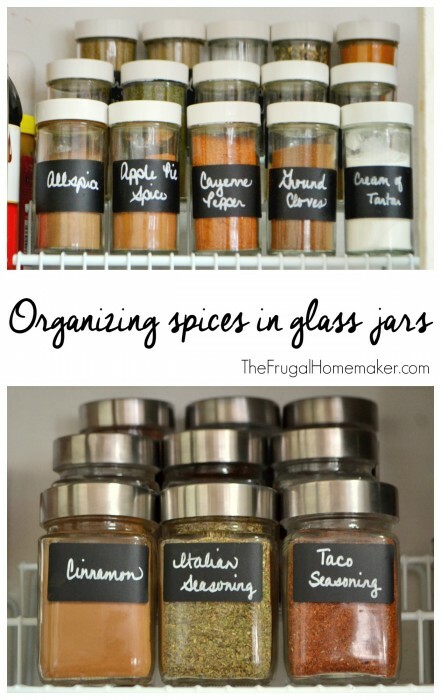 And this particular change incorporates glass jars and chalkboard labels – two of my favorite things! So this was the small cabinet that I used to store baking supplies and spices. I also stored some spices in a rack attached to the back of my pantry door. BUT I have been wanting to get rid of the rack for a long time (more on that later) and also find some uniform way to store spices. Some spices I buy in bulk at Aldi or a warehouse store and then some I buy in smaller bottles since we don’t use them as much. So I had bottles of all different sizes, shapes, and brands and they just don’t organize well at all even using those nice little tiered organizer shelves. 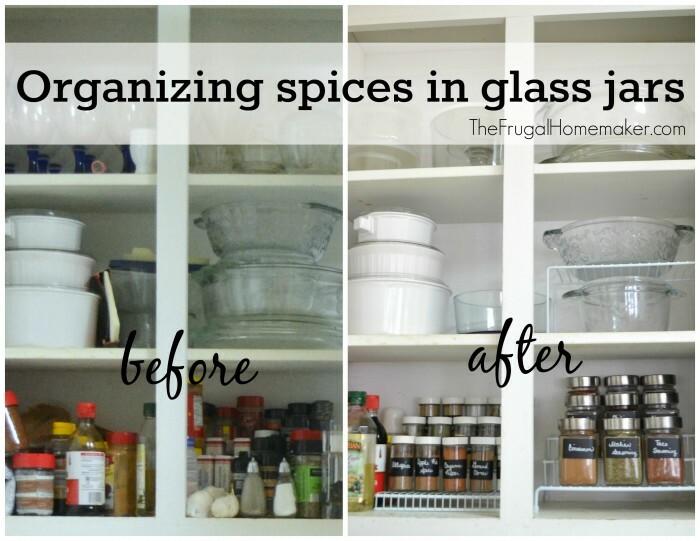 The smaller jars were from a spinning spice rack that we got as a wedding present but I had already gotten rid of it several years ago – it didn’t hold all we needed and I really didn’t want it on the counter. But I saved the jars! The larger jars I picked up at Hobby Lobby in the glass aisle (with all the mason jars and canisters) last week when all glass was 50% off so they were only $0.99. So I went to town setting up my spices! I added a chalkboard label on each jar and emptied all the spices into a large or smaller jar depending on the amount of spice/size of jar I had. Then just labeled them with the chalkboard marker. The chalkboard markers are semi-permanent meaning they won’t just wipe or smudge off BUT they come off easy with a sponge and water or a magic eraser if they seem to leave a faint mark. I picked up another tiered shelf at Dollar General for $3.00 (I already had the one on the left you just couldn’t see it behind the mess! ), but you can find those shelves anywhere. The smaller jars I organized alphabetically. 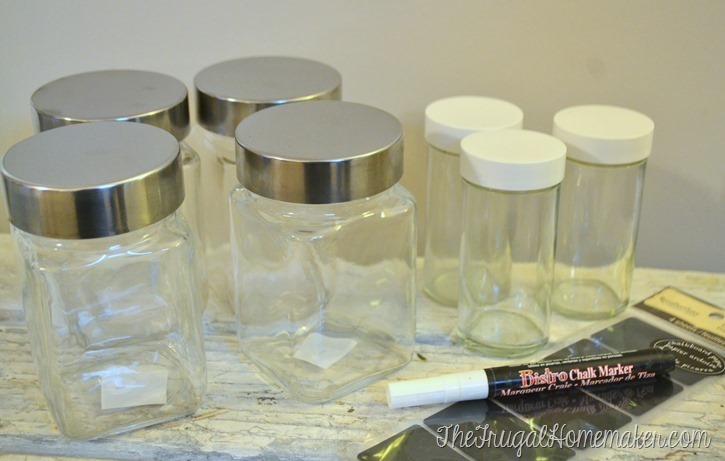 And the larger jars I organized alphabetically BUT I kept the 3 that I use on a weekly/almost daily basis on the front. 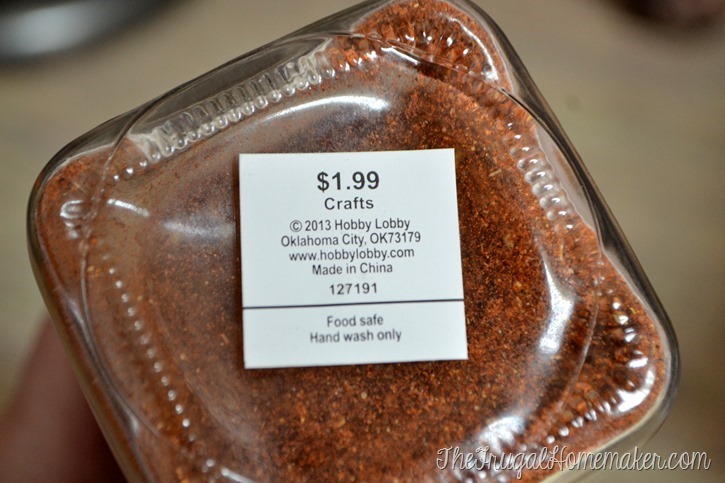 I actually need to pick up some more jars from Hobby Lobby (I bought all they had) because I have a few more larger spices to add (a chicken seasoning blend, hamburger seasoning blend, and I need to make up some pumpkin pie spice too). I can fit 4 of the jars across each shelf and then even add a row in the front in my cabinet so could expand to 16 jars if I need to. 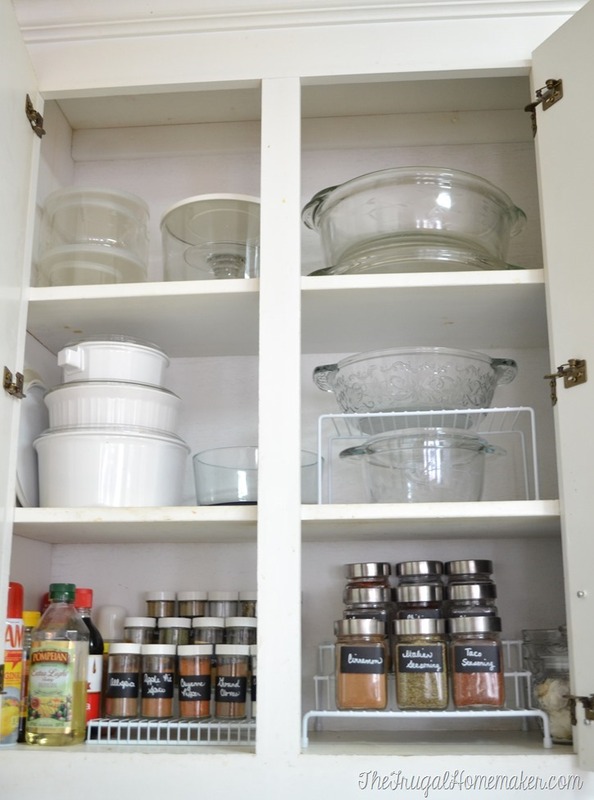 No more disorganized/don’t open the door from embarrassment when company is here cabinet! 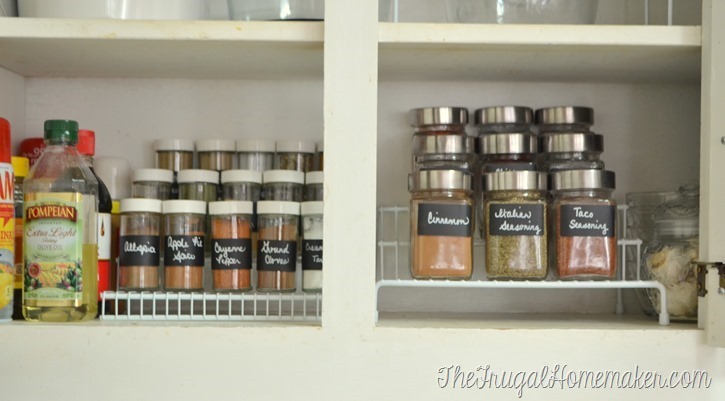 Functional, organized, and pretty cabinet and spices! 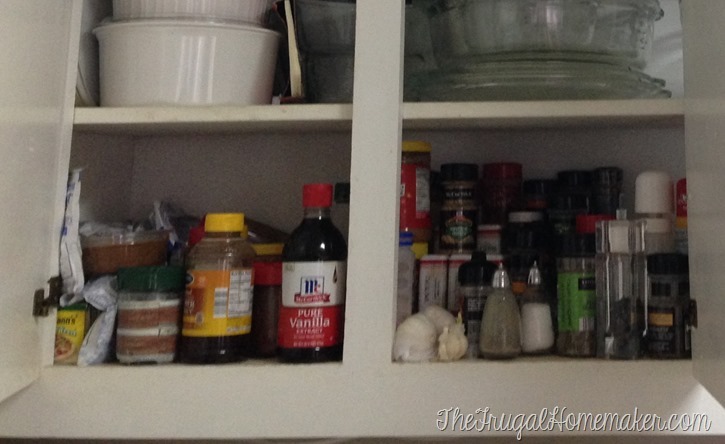 How do you organize your spices? I would love to be able to store them in a drawer but don’t have any drawers deep enough. This same method would work just get small round labels to stock on the lids. So many options! I am participating in A Celebration of Winter tour (look for my post on Thursday) so until then you have plenty of time to check out some of the amazing ideas the other bloggers have been sharing this week. 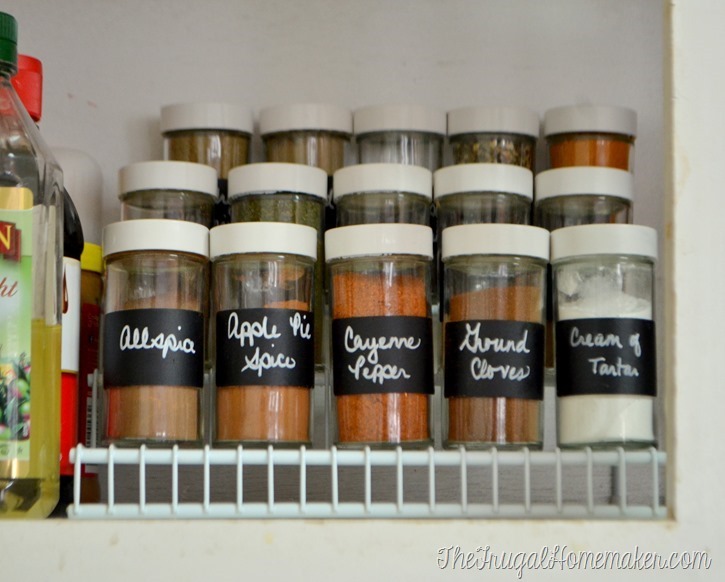 I love how your spice organization turned out – they look so nice in your cabinets! I’ve been doing some de-cluttering and organizing, as well. I have the 3 tired shelves, but were trying to make the original spice/seasoning containers work. Thanks for sharing your ideas – that looks like an option I’d like to try! Looking forward to your “winter” post later this week! Wow! What a difference. Looks so good and easy to find just what your looking for. Thank you for sharing. I organized my spices last week, now I want to donut again with pretty jars! Yours look great ???? I think you are really going to enjoy that organization. One money saving tip for you. 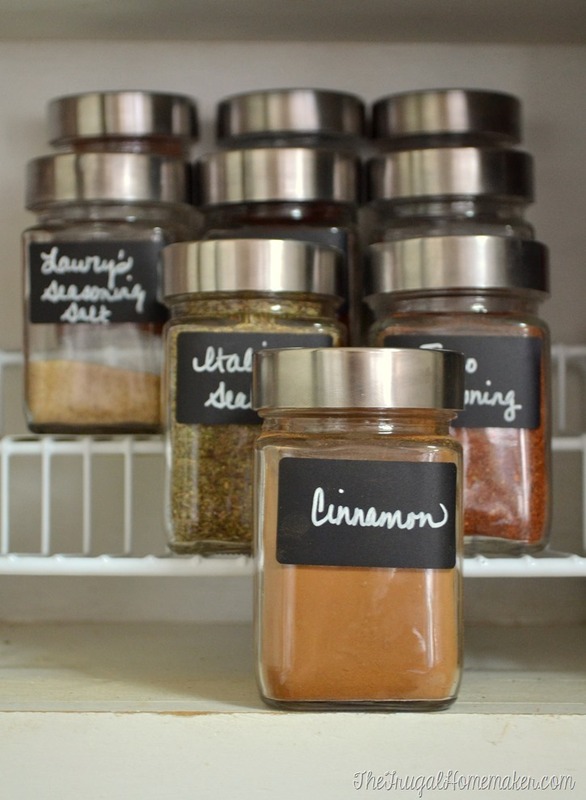 If you have a store near you that sells bulk spices, buy them this way when you need a new one or to refill your jars. It is so much cheaper! Sometimes I just throw out certain ones and refresh them before the holidays if I think I need to or like you said, you can put a sticker on the bottom. I usually mark them with the date I refill them. Hi! Enjoying all that you do/share! I too am reorganizing & am currently working on my spices as well. I wanted to let you know that you can always order additional jars thru hobby lobby.com. I bought my store out as well of a particular jar. I needed many more & wanted to get them half off as well. The shipping wasn’t too awful either…around $5 for almost 50 jars. Two did arrive broken but they will of course replace them for me. One question…can you give more info about the chalk pen you purchased please? It appears to be a fine point & that’s exactly what I need. Thank you so much! Thanks for the great ideas! 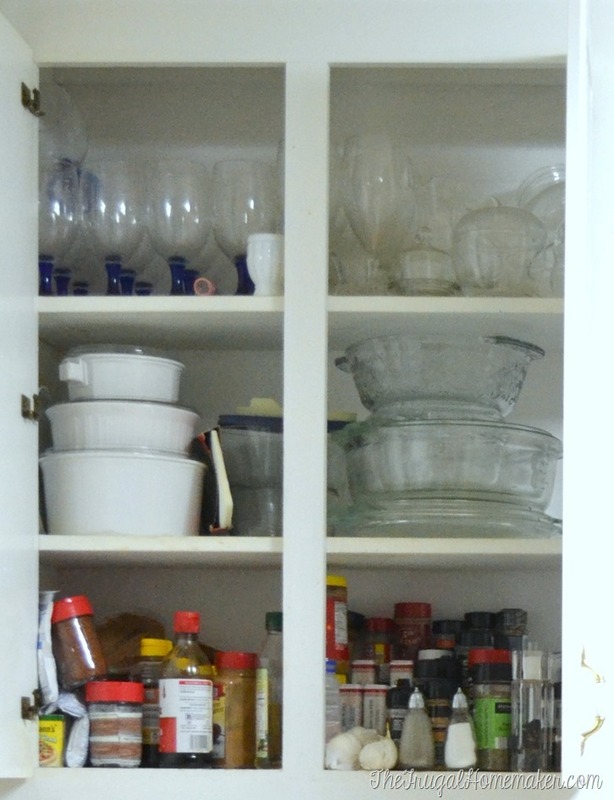 I have a pantry in my kitchen that used to be a closet and have my spices, etc. in there but it is hard to find what I need because they are all on the same level. The tiered racks would work wonderful, and I was just thinking how nice it would be to have all jars the same size (or a couple of sizes like yours). We buy all our spices in bulk from either Azure Standard buying club, Vitacost, or Mountain Rose Herbs and I have transferred them to glass jars that I have on hand from used products like peanut butter. I like this idea. 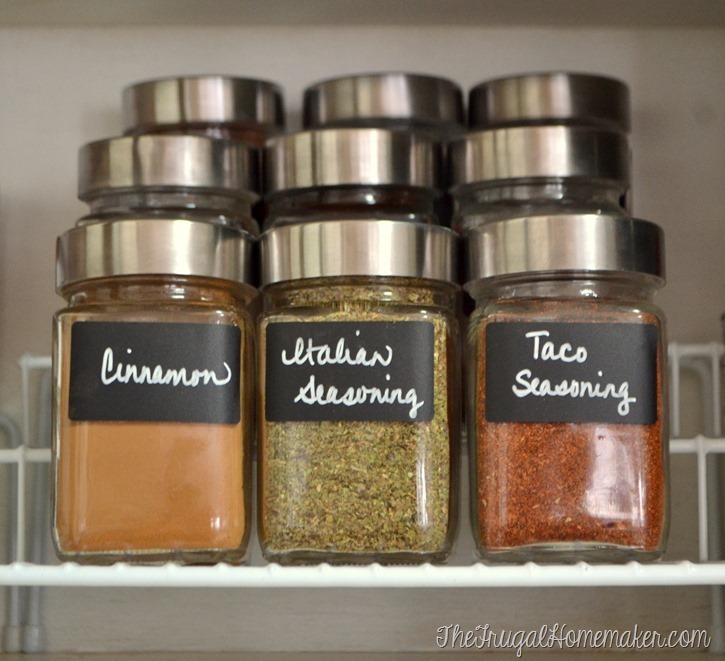 I love this idea but didn’t want to pay $10 for spice jars – guess where I found them? At Goodwill Outlet (the one you visited) yep found 12 glass matching jars…guess they are for spices but if not they are now..they sure fit the bill for size, quality and price….paid $.57!! Really? You went to the Columbia one? Have you considered a Spice Stack? The benefits of a drawer in the space of a cabinet. I have had mine 3 years and my only regret is that I have not switched to uniform jars to leverage bulk spices.